Phoenix Law Enforcement Association > PLEA News > Is Officer Safety being Compromised for Political Expediency? Is Officer Safety being Compromised for Political Expediency? On April 6, 1970 in the parking lot of a Standard Oil gas station in Newhall California, four California Highway Patrol Officers were gunned down and killed during a traffic stop involving two armed felons. 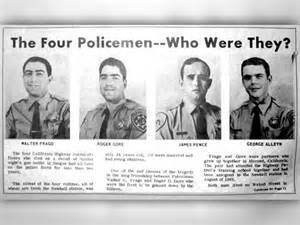 Officers George Alleyn, Walt Frago, Roger Gore, and James Pence lost their lives that fateful night. At the time of the occurrence, this was the single largest loss of life in the law enforcement community nationwide. In the ensuing years, this shooting would simply be referred to in law enforcement circles as the “Newhall Incident.” Over the years, books and training documents have been written about the Newhall Incident and the lessons learned have been widely disseminated and taught at police academies as well as police training seminars nationwide. The article below published March 4, 2016 and authored by Mike Wood LTC (ret) examines the political ideologies and training practices of the day that contributed to the Newhall Incident and how those same ideologies and practices now seem to be coming full circle in the current political climate we find ourselves in nationwide. Mike Wood is the author of Newhall Shooting: A Tactical Analysis is considered by many to be one of the most thoroughly researched works and analysis on the Newhall incident.